Marsh recently published its 2013 Captive Benchmarking Report, analyzing 886 captives for benchmarking analysis, representing approximately 15% of all captives globally. One key finding is that more than half of the investments made by captive insurance companies consists of loans to their parent companies, a growing trend since the economic downturn of 2008 when captives were heavily invested in equities. The motivation behind intercompany investments with the parent entity or affiliates is to minimize the cost of capital employed in the captive and enhance the parent company's liquidity. Additionally, the parent company has greater control over the captive’s invested assets. 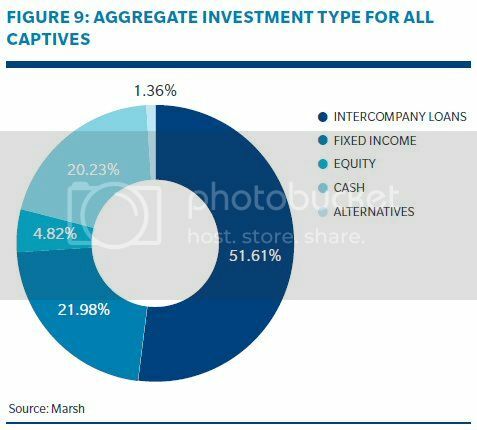 For the balance of captive porfolios or for those not involved in intercompany loans, the investment portfolio is designed to capture investment yield while maintaining adequate cash for liquidity and working capital. (See Figure 12 below) This data is consistent with an NAIC study, Analysis of Insurance Industry Investment Portfolio Asset Mixes, where the majority of insurance industry investments were in bonds (69.7% of total cash and invested assets) followed by investments in common stock (10.3%). The average captive investment mix is similar to a typical commercial insurer, however some captive portfolios display a wider range of investment strategies. 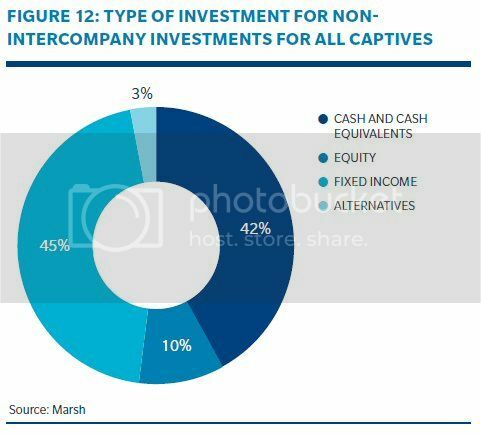 While many captives invest exclusively in cash and cash equivalents, others employ much larger allocations to equity (30%+) and alternative investments, which include hedge funds and private equity investments. It should be noted that new research from ING Investment Management has revealed that insurers are likely to take on more risk in the future. 68 percent of those interviewed anticipate that their allocation of funds to equities will rise, and 67 percent anticipate their exposure to emerging market securities will also increase. With the U.S. Federal Reserve Bank (Fed) keeping its Fed Funds rate near zero for more than four years, all investors will likely seek alternatives to boost performance as bond prices will decline when interest rates begin to rise.